My mom’s stay in Morro Bay is over. She’s now in Houston, visiting my brother and having all kinds of adventures there. After Sean and I said goodbye to her at the airport, I was feeling a little sad. We went out for lunch in San Luis Obispo and then drove back to Morro Bay. On our way home, we stopped at Grandma’s Frozen Yogurt for a bit of a treat. They have a nice outdoor patio where you can enjoy your frozen yogurt and do some people watching. That’s where I spotted the small pots of pumpkin seedlings in the corner. The sign indicated that they were free to anybody who wanted some. According to the sign, if you planted the seedlings now, the pumpkins would be fully grown by Halloween. Naturally I helped myself to one of the free pots. “Take as many as you want,” the woman who rang up our yogurt urged. So I took three more. Sean had to stop at Miner’s Ace Hardware to purchase a few items, so I tagged along and browsed through the gardening section. That’s where I saw The Gnomes. I wanted to buy all of them, but they were kind of pricey, so I only allowed myself to pick two. I figured I could always go back and get the others after payday. When Sean and I got up to the cash register, I set them down on the conveyor belt and the cashier looked at them fondly as if they were old friends. She even patted one on the shoulder. She rang up our purchases and didn’t say a word to me about the gnomes, although she was completely friendly and nice. Just an average, every day, unremarkable hardware store buying and selling experience. I couldn’t help feeling immensely cheered after that. 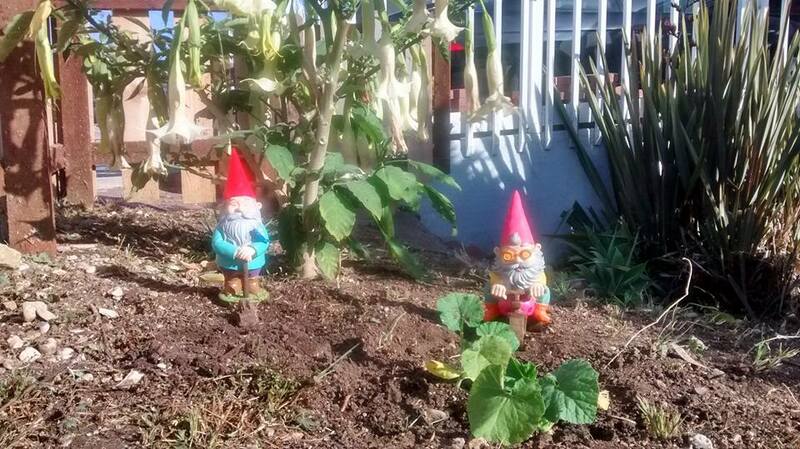 Two little pumpkin seedlings and the garden gnomes in the late afternoon sunlight. 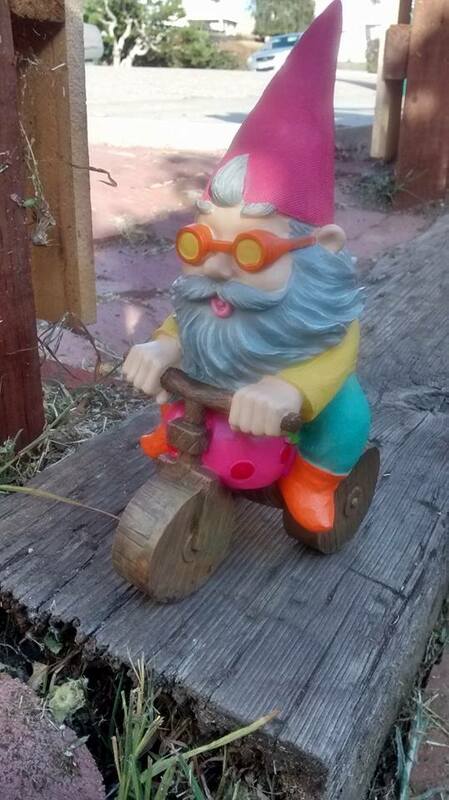 Close-up of Gnome #2. No woman could resist his charm.